Update:I’m thrilled to share that I’m a featured blogger for Oprah’s Holiday 2009 where this recipe is being featured! Sounds like sneeze, those fancy French words that I can’t ever get right! And so easy that even *I* an oven-fearing, non-baker could master it on the very first try. So easy that I’ve made these cute little babies 6 times in the past 6 days. Either way, you MUST make these — like TONIGHT! Or perhaps your holiday meal? 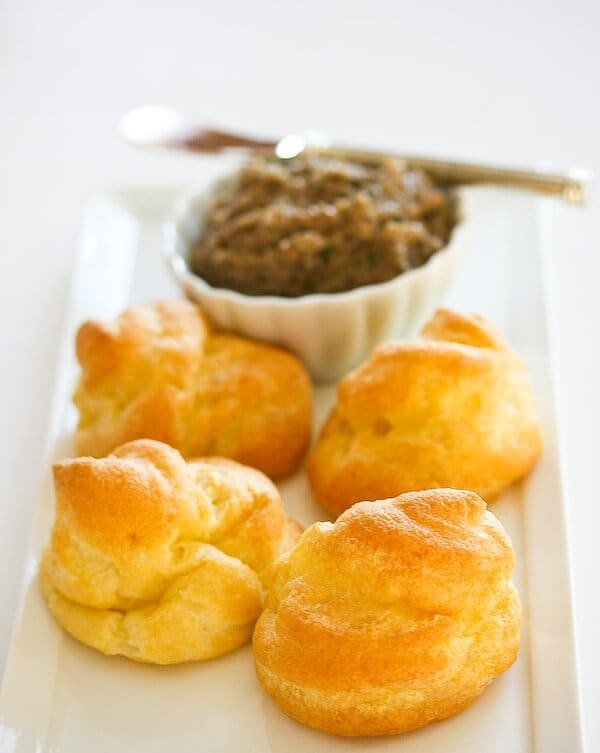 I’ll be making Pâte à Choux for our Thanksgiving dinner! Actually, I’ll add gruyere cheese and make gougeres. 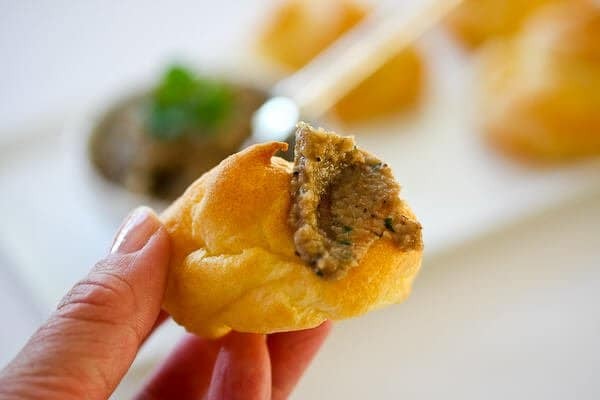 And if you try to make me pronounce gougeres, I can’t. So we’re calling them “Fancy Cheesy Puffy Poofs” at dinner. Rule #1: Simplest is best. Oh but wait. I know what some of you smarty pants are going to say – this isn’t a TRUE Ruhlman ratio. A true Ruhlman ratio is by weight. And my 1:1:1:1:1 isn’t by weight — it’s just my way of remembering this recipe. 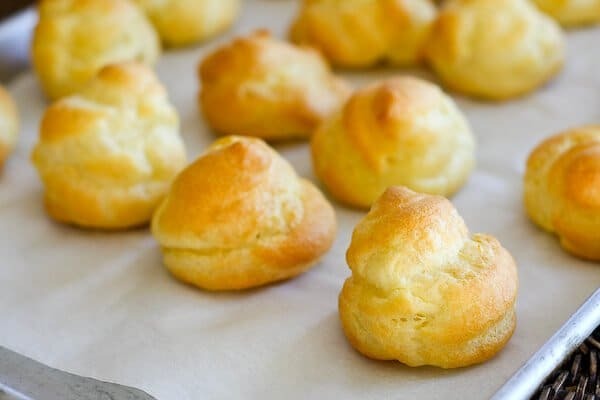 This choux dough is so versatile, that you can make the puffs sweet or savory. In fact, you can fill ’em with cream to get Cream Puffs, fry them to get farts of nuns, make easy donuts, stuff them, boil them, dip them in chocolate, drizzle them with chocolate, serve ’em with sauteed cherries, make cute little ice cream sandwiches with them, dip in peppermint fudge sauce, boil/saute for parisian gnocchi <- watch those 2 videos of Thomas Keller. 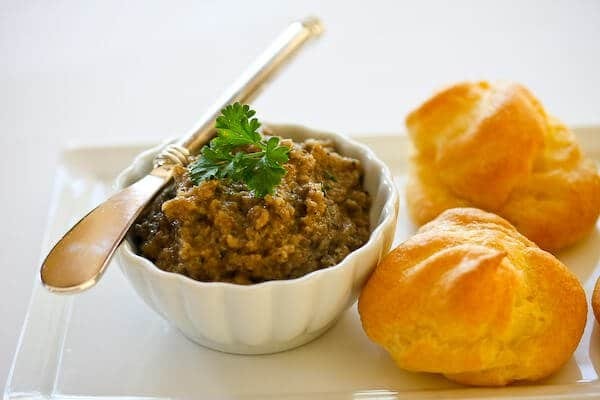 If you’d like to try the Easy Mushroom Pate shown in the photo below, you’ll have to head over to Tasty Kitchen. Add a bit of truffle oil to that mushroom pate? Now that’s luxurious! 1. In a medium pot, bring the water and butter to a simmer on medium heat. Add the flour and with a wooden spoon or spatula, stir very quickly in one direction. Carefully watch and you'll see that the flour starts absorbing the liquid -- and a dough will form. Keep stirring to continue cooking the flour and cook off some of the water, another minute or two. 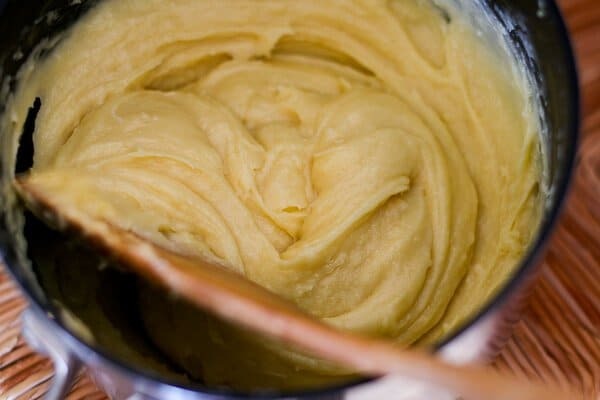 Transfer the paste to the bowl of a standing mixer fitted with the paddle attachment or to a bowl if you're using a hand mixer. If you want to mix the eggs directly into the dough in the pot, let it cool slightly, 4 or 5 minutes, or cool off the pan itself by running cold water over its base if you will be mixing the eggs in that pot. You don’t want to cook the eggs too quickly. 3. Add the salt and the eggs one at a time mixing rapidly until each is combined into the paste. The paste will go from shiny to slippery to sticky as the egg is incorporated. 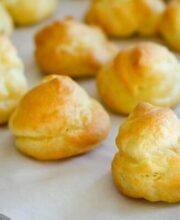 The pâte a choux can be cooked immediately at this point or refrigerated for up to a day until ready to use. 4. 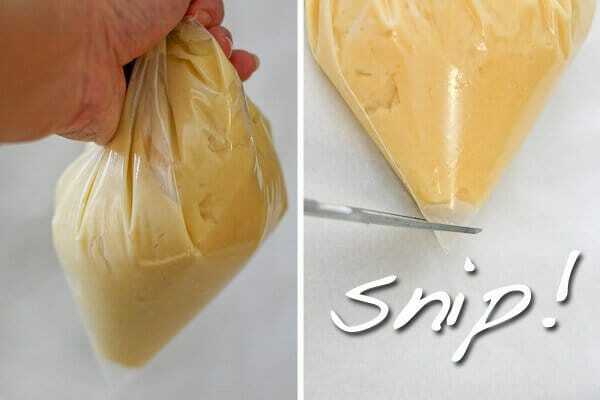 Spoon the dough into a large gallon-sized plastic bag (or piping bag.) Use your hands to squeeze dough towards the bottom corner. With kitchen shears, snip off just the tippy tip of the bag, about 1/4" of the tip. 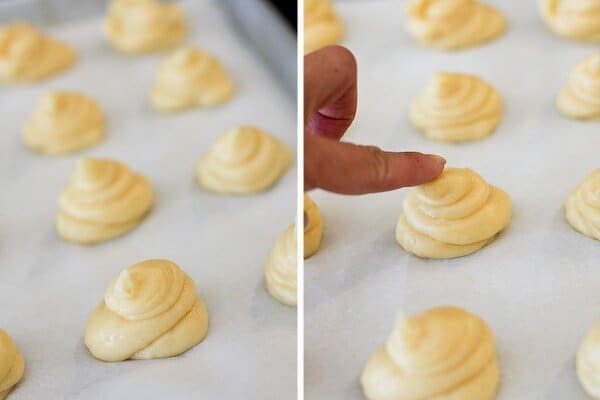 Pipe onto a baking sheet into little puffs, keeping the puffs 2-inches apart. With your finger, press down the peaks (as they can burn.) Bake at 425F for 10 minutes, then 350F for 18-30 minutes, depending on the size of your puffs. Stir in 1/2 cup finely grated gruyere cheese (or other grated hard cheese of your choice) + 1 teaspoon kosher/sea salt (1/2 teaspoon fine table salt) - I used a rasp/microplane grater to get ultra-light snowflakes of cheese so as not to weigh down the dough with heavy cheese. You can also sprinkle a bit of the cheese on top of the puffs after you've piped them.